The Vendiplas multi purpose plastic cold room shelf is a versatile product that is ideal for storing and organising all types of food products. The unit can be both static and mobile mobile and is compliant to all food industry standards. Custom sizing available to fit any cold room dimensions. 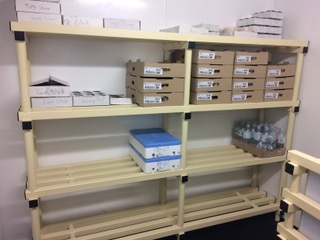 The Vendiplas single shelf unit is a strong and durable product that is ideal for storing and organising food products in the cold room environment. The unit can be both static and mobile mobile and is compliant to all food industry standards. Custom sizing available to fit any cold room dimensions. The Vendiplas mobile tray trolley is purposed designed to maximise tray storage space for a wide variety of food products. Ideal uses include bakeries, cold rooms and kitchens. The unit is mobile and stable with the use of braked wheels that allow for easy transportation. The Vendiplas mobile basket trolley is purposed designed to maximise basket storage space for a wide variety of food products. Ideal uses include bakeries, cold rooms and kitchens. The unit is mobile and stable with the use of braked wheels that allow for easy transportation. The Vendiplas mobile basket trolley is larger purpose storage unit designed to maximise basket storage space for multiple food products. Ideal uses include bakeries, cold rooms and kitchens. The unit is mobile and stable with the use of braked wheels that allow for easy transportation. The mobile cutting table is a unique product that can be fitted with a cutting surface to customer choice. The unit allows for underneath storage and easy mobility anywhere in a cold room or kitchen environment. It is easy to clean, strong yet light weight for easy mobility. 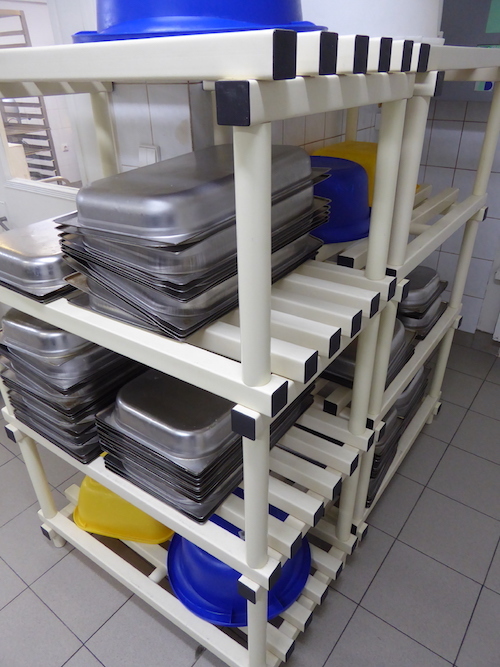 Ideal for food preparation in a wide variety of industries including meat and fish factories. Custom sizing available, supplied without cutting surface. The mobile feather icebox is a strong and durable container constructed to withstand the weight and wear and tear of daily ice loading and spreading. The unit is designed to sit under a flake ice machine which can then be easily moved in any food or preparation area. Custom made to suit customer cold room area requirements. The perspect inlay shelf is a practical accessory used to cover the tops of shelves in order to maximise storage space for smaller items. It is ideal for both food and non food products and is easy to clean and remove when required. Custom sizing available.